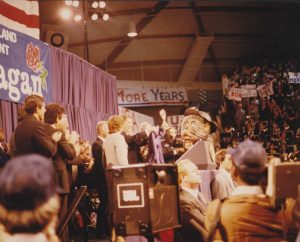 The University of Portland’s newly dedicated Chiles Center athletic arena still smelt of fresh varnish and the stadium seating was still cushioned and clean when President Ronald Reagan’s re-election campaign visited the Chiles Center in October of 1984. 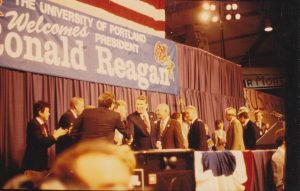 Appearing before a crowd of students and Reagan supporters, President Reagan (R), focused his remarks on national security while speaking out against his opponent, former Vice President Walter Mondale (D-MN). Reagan deviated from his prepared speech with occasional quips meant to quiet and deflect hecklers in the audience. President Reagan visited UP two weeks before the national election, carrying away the roars of an enthusiastic crowd and a Pilots jacket presented by UP Student Body president, Kelly Krautscheid, ’85 and Wally Pilot. I remember that time very well. The Chiles Center opened and then Reagan came. They were huge events for The Beacon staff. I had to smile when I read the article. 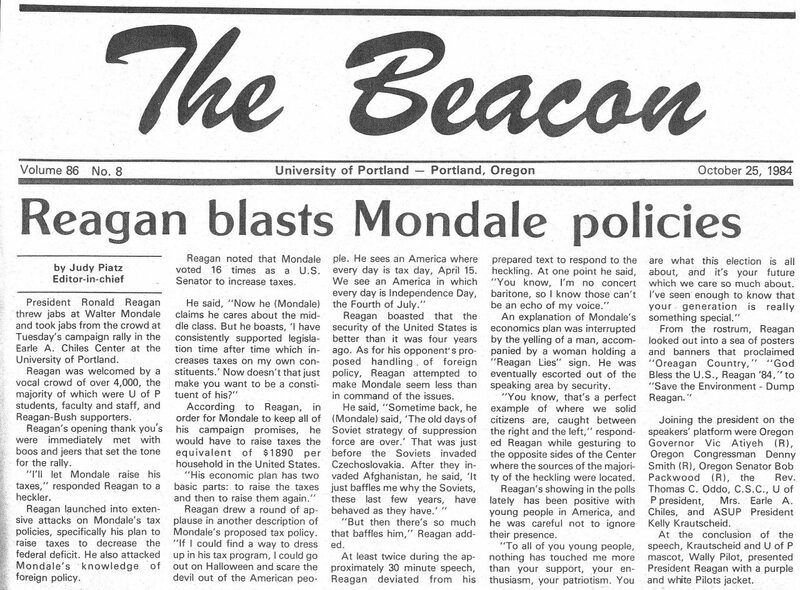 I’m still writing about politics and other news 32 years later, but now I’m doing it for TV. My two sons were 10 and 8 years old in 1984 so I took them out of school for the morning to join me in the Chiles Center. However, I was playing bass clarinet in the University Wind Ensemble at that time and needed to be there at 7:30 AM so the boys came with me at that early hour. We had to use a rear entrance to Chiles, designated for those involved in the event. A security check was also required for everyone. The case for my instrument was fairly large, dare I say suspicious looking, so I had to open it for inspection. Further along someone handed me the sheet music for “Hail To The Chief” which we rehearsed before the doors were opened to the public. We were asked to return the music after the event but I confess that it got “lost” in my instrument case, a souvenir of a singular event. Alas, I have misplaced it in the intervening years. My sons sat just behind the musicians and afterwards I took them back to their school: a civics lesson for real.